Once a tuner favorite, the Eclipse never really made the transition into the 21st century. It’s not a bad-looking car, but for something that is supposed to have some sporting credentials, it simply doesn’t cut it. In GT trim you can get a 3.6-liter V6 that puts out a very ten-years-ago 265 horsepower, and for about the same price as the 412hp Mustang GT. 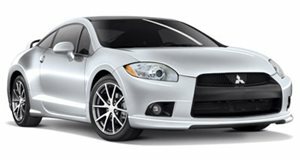 It’s a shame to see how far the once-proud Eclipse has fallen, but this is what happens when a carmaker stops making an effort. The Eclipse’s old rival, the Toyota Celica, has evolved into the Scion tC, it’s a better bet.